When trying to identify a Classic Maya individual, the first task we have is to isolate that individual's name in hieroglyphic inscriptions. Since the vast majority of surviving Classic Maya monumental texts are historical in content, it follows that they should contain the names of historical individuals. The question is how can we break down the inscription in order to identify references to individual names from the rest of the text? One way is to work out where in the hieroglyphic sentence the name is likely to occur: for this we need to know about Maya syntax: the word order within Maya hieroglyphic sentences. It is now well established that the preferred word order in Maya hieroglyphic inscriptions is Verb-Object-Subject (this is also the usual order in modern Mayan languages). Many hieroglyphic sentences involve actions of the king, and in most such statements there is no grammatical object-just the verb and the subject (who is the king). Also, since most surviving Maya inscriptions are historical in nature, dates usually are involved. 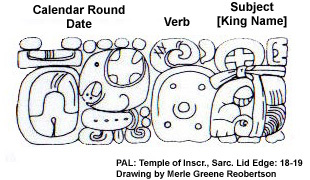 Maya hieroglyphic dates are typically recorded at the beginning of the sentence (usually in 'Calendar Round' form), and are often introduced by a 'Distance Number', an interval of days, months, and years leading from the date of the preceding sentence to the date of the sentence at hand (see Maya Dates). In other words, most Maya hieroglyphic sentences consist of the following sequence: Distance Number, Date, Verb, Object (if present), Subject. Some sentences are so short that the identification of the subject is quite easy. For example, in the text on the edge of the sarcophagus below the Temple of the Inscriptions at Palenque many of the passages consist of the Calendar Round date and just two other glyphs. In most cases the glyph that follows the Calendar Round date is identical, and it is logical to assume (with our knowledge of Maya syntax) that this glyph should be the verb of the sentence. The other glyph, then, should be the grammatical subject, and if the text is indeed historical, it should record the name of the person who is doing the action of the verb. Presumably, if there is only one name glyph recorded, as in many of the passages of the Sarcophagus Lid Edge, that one glyph is the customary name of the individual. In other references to the individual, there may be additional glyphs, which comprise a more extended name phrase containing other names and titles of the individual. 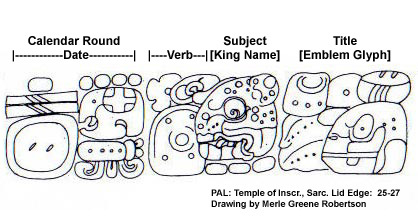 The additional glyphs in a more extended name phrase commonly contain additional names of the individual as well as titles that the individual held, and sometimes also a statement containing his or her parentage (see Classic Maya Names: Introduction). An additional way in which we can identify historical individual names is by looking at glyphic captions that often accompany their portraits. These captions are invariably adjacent to the portrait of the person they name, and often the name phrase is preceded by the hieroglyph u b'ah, '[It is] the image of ...', although sometimes just the name is recorded. To summarise, we can usually identify personal names of historical individuals with a high degree of reliability. Minimally, their personal name is recorded, but more often we also get additional names and titles. Calendar names, so common elsewhere in Mesoamerica, are very rare in Classic Maya texts. The names by which we know the Maya kings appear to be 'royal' names, adopted upon their accession. Because of the issue of legitimacy in royal succession, many kings recorded their parentage, enabling us to begin the reconstruction of royal genealogies for several of the greatest Classic Maya kingdoms. 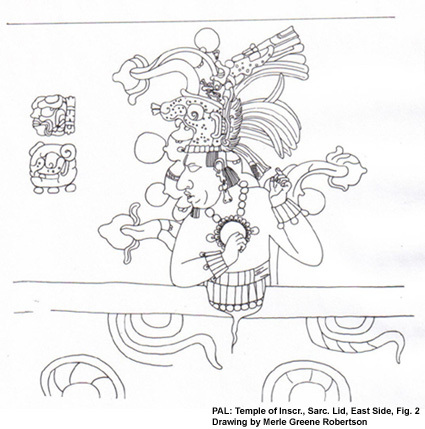 Titles are common in the name phrases of Maya lords, and their study is important for our understanding of Classic Maya social organisation and the Classic Maya court. Some titles seem to be universal, while others are distinctly regional.